Good Charlotte have released the first song from their new studio album, which will be called Generation Rx, and announced a 2019 London Good Charlotte show. Actual Pain is now available on Spotify, Apple Music and more – listen to it your choice of digital provider here. It’s also on YouTube with a teaser video. The album will be released on 14 September, it has been confirmed. 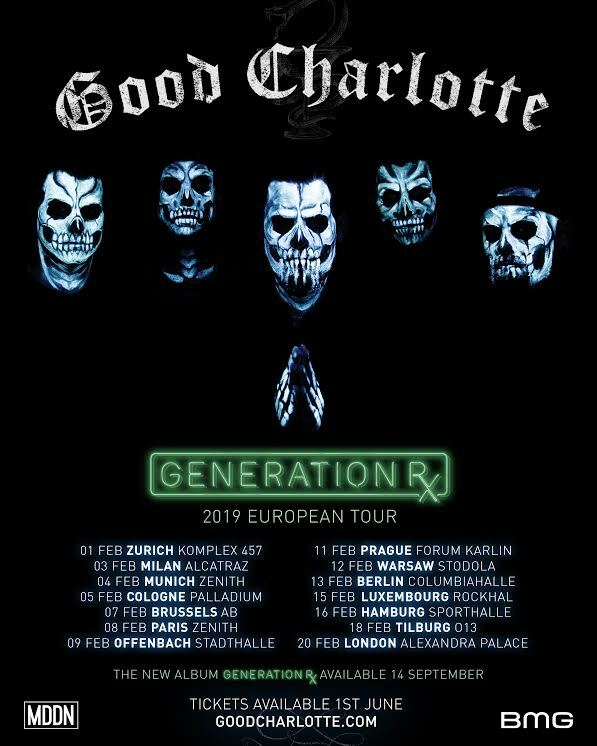 Good Charlotte also this morning announced dates for a European tour for Generation Rx. They will be playing at Alexandra Palace, London on Wednesday 20 February 2019. Tickets will go on sale to members of their fan club, GC Fam, at 10:00am on Tuesday 29 May and to the general public on Friday 1 June. Good Charlotte’s UK tour is, sadly, now over but all the fans can agree that they put on a fantastic run of shows and it was like they’d never been away. (And I was luckily enough to bump into Billy and Paul before the show). Punktastic say ‘it’s always great when you can just tell that a band are having just as much fun up there as the crowd are’. Kerrang say ‘they have a renewed lease of life’ and gives them 4 stars/Ks. Original Rock say ‘they definitely have not lost their touch live’. ‘Good Charlotte manage to maintain the energy and the noise levels throughout an excellently planned-out set’ says Dead Press. ‘LOUD’, says Mel’s Jukebox while ‘this show was epic’, is Tumblr blogger’s soundsdandnoises conclusion. ‘Charisma, talent and down-to-earth attitudes; the band had it all’ adds West Midlands-based Native Monster. Youth Authority is finally released! 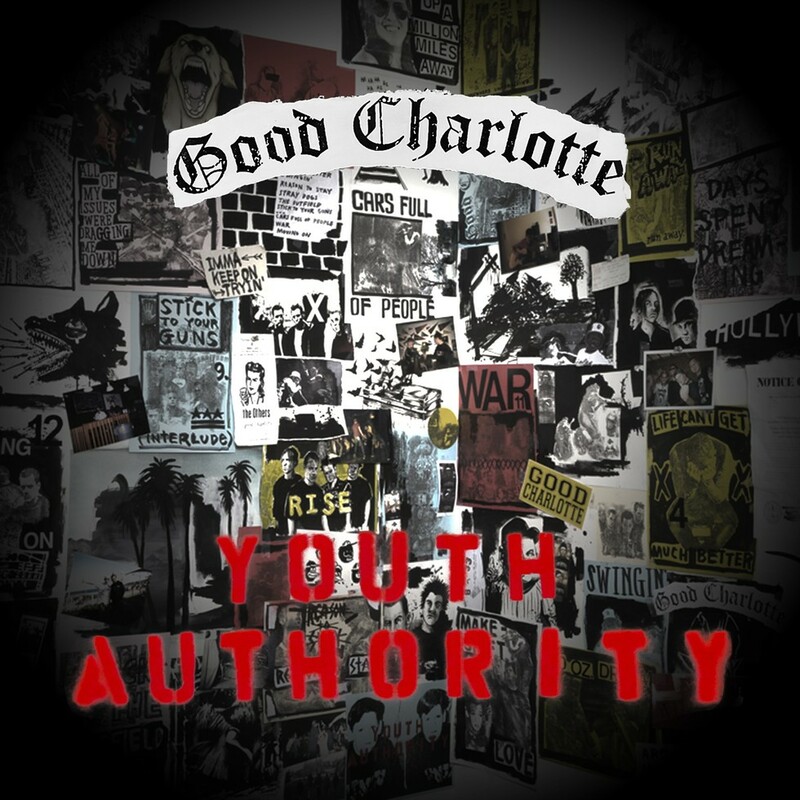 Six years since their last album release, Good Charlotte’s Youth Authority is now out! It’s available on iTunes and Apple Music now (with bonus track Rise), is set to be on Spotify from next week and is also available from HMV on CD and vinyl with two bonus tracks – We’ll Let It All Out and Life Is Hard. Hopefully they’ll play some of the new tracks live for us on their UK tour next month. You can now pre-order the new Good Charlotte album! Good Charlotte have released pre-order packages for their as-yet untitled sixth album and revealed the release date for their next single. Pre-order packages including t-shirts and the record on vinyl are now on sale in Good Charlotte’s official store. Shipping costs to the UK range from $14.70 (£10.38) for delivery 8-24 business days after the release to $61.83 (£43.66) for delivery 4-5 business dates after the release. Their single will be released on April 4, according to Entertainment Weekly, ahead of the release of the album this summer. It comes as the band announce a short run of US tour dates playing in Philadelphia, Washington DC, New York and Boston. Those pre-ordering the album can get priority access to tickets for the US dates. The last new Good Charlotte song was Makeshift Love, released in November. They teased new music last week by tweeting a clip of the video they showed on their UK tour last month. On their UK dates earlier this year, Good Charlotte said they’ll be back in the UK later this year. For the last Good Charlotte UK tour date, the band headed up to Scotland to play at show at Glasgow’s SSE Hydro. Here’s just some of the pictures and videos from the gig! @GoodCharlotte at the SSE Hydro Arena Glasgow. Thank you Scotland!!! For the fourth date of the UK tour, Good Charlotte visited the Midlands to play at Birmingham’s Barclaycard Arena. Here’s a selection of your pics and videos! Good Charlotte have confirmed that their return after going on hiatus in 2011 is not just for one album. Speaking before their show at Manchester Arena, Benji and Joel said they’re looking at making another one or two albums after the release of their as-yet untitled sixth album – although Billy pointed out that they’ll continue to make music indefinitely as long as it remains fun. The sixth album is due to be released this summer and is currently being mixed, and Benji and Joel said it contains some of their best music to date. The band also revealed some of the songs they’re most proud of. Benji and Joel highlighted ‘Emotionless’ and a song written for 5 Seconds of Summer, ‘Amnesia’, as some of their favourites – as well as the Madden Brothers album ‘Greetings from California’ as it was very personal to them. When asked about their best memories of spending time in the UK, the band said they love playing gigs in the UK as the crowds are always so lively – although Benji did highlight another good memory was when they played a show at Alton Towers in 2004 as they travelled to the gig by helicopter. Good Charlotte confirmed they’re currently planning their next visit to our shores – with October/November looking likely for the next Good Charlotte UK tour. Exciting times – Good Charlotte have revealed some more details about their upcoming album in an interview with Rolling Stone. The band’s sixth album will be out in May, the magazine reveals – but they’ve not yet announced the name. Hopefully we’ll hear some of these new tracks on the upcoming Good Charlotte UK gigs in February! 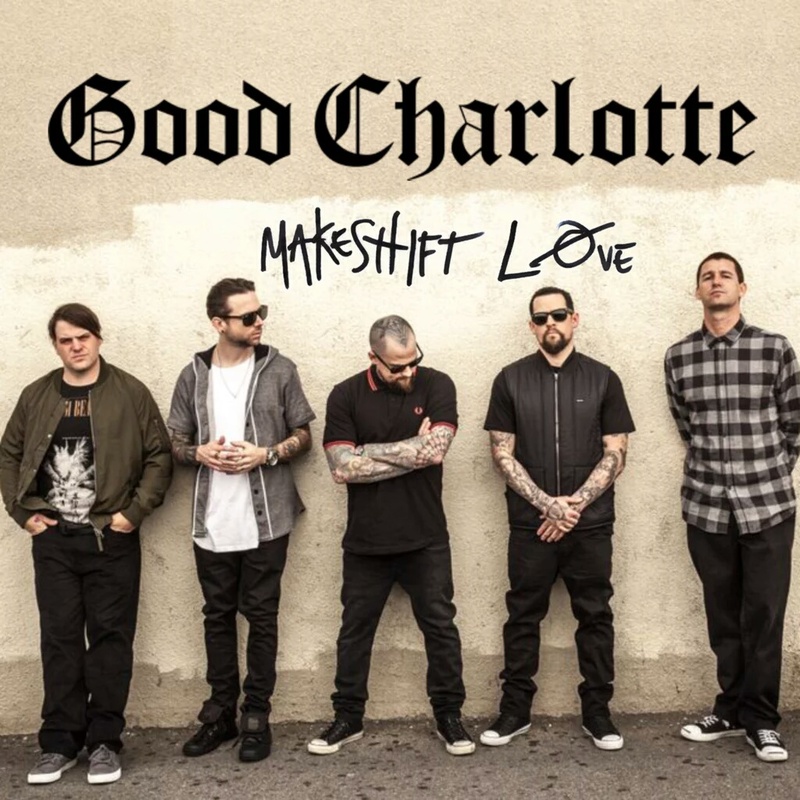 Good news for Good Charlotte UK fans – Makeshift Love is now available on Spotify! It looks like everything happens all at once! As well as releasing Makeshift Love on iTunes, Good Charlotte have now released a lyric video for the new song! With the release of the video and the confirmation of a live gig in LA, let’s hope Good Charlotte UK tour dates aren’t too far behind!